What systems does OWU use? BishopApps is OWU’s online application suite powered by Google Apps for Education. It provides faculty and students with web based email (BishopMail), contacts, calendars, tasks, productivity applications (documents, spreadsheets, forms, presentations, and drawings,) file storage, personal web pages, and a whole lot more. BishopApps can be used for all kinds of information sharing and collaboration. Drive may be used as a shared file repository or dropbox. Sites may be used as a course wiki, an online file cabinet, a blog, a notice board, or one’s own professional website. Calendars may be used for your own time management, to invite colleagues or students to events, or to allow students to sign up for appointment slots. 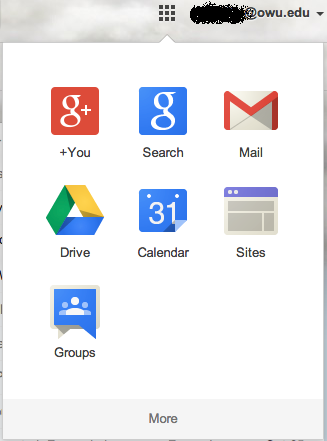 Google Hangouts (web conferencing) is available in BishopApps +. David Soliday, OWU Instructional Technologist, is available to consult and advise on the best way to use BishopApps for your pedagogical purposes, and/or to explore alternatives. For more information on OWU BishopApps, see the BishopApps page. How do I get my user account information? All new faculty/staff and students are given a user account. The username is the first letter of your first name, first letter of your middle name, and the first six letters of your last name while the email account is @owu.edu. An example username could be: fmlastna@owu.edu. You can create the password that you would like to use (see the Password page on the Self-help site for more information). This information is used on all OWU systems. How do I log into my BishopMail Account? To login to BishopMail, go to http://mail.owu.edu and login using OWU username and password. For additional information, check out the BishopMail page on the Self-Help site. How do I access Bishopapps from BishopMail? Next to your email address in the top right hand corner there is a square made up of black dots. Click on the square and a drop down menu will appear with all of the apps such as calendar, drive, sites and more. How do I share the BishopApp files I make with my students or other faculty? Sign in to BishopMail via the OWU home page: https://www.owu.edu/. Click on the Apps icon at top right (small squares). Then click on Drive. Click on the red New icon. Click on ‘ File upload’ in the box that opens. Browse to find the file you wish to share, and click Open. You can upload Microsoft Office Excel, PowerPoint, and Word files, as well as others. Once uploaded and converted,the file will appear in your drive. Double click the document to open. Now, to share the document with others, click the blue ‘Share’ button at top right. Add emails of those you want to share it with. You can search by name in this box and then select the correct person. When you have added everyone click done. Choose ‘People at OWU BishopApps with the link’ in the drop box. Copy the link and press ‘Done’. Paste this address into an email and send to everyone you wish to view the spreadsheet. Once they click the link and open the file in BishopApps, the spreadsheet will show up as one of their documents so they can access it by clicking on Documents, rather than using the link in the email. Likewise, editors will be able to find it in their Documents list to update it. Once you (or they) have opened up the spreadsheet you can see the revision history by selecting See revision history from the File menu. PowerCampus, by Ellucian (formerly SunGard,) is OWU’s student information system (SIS) or the system of record for all academic records. The Registrar’s Office and certain other staff use PowerCampus clients to access student and class section information on their office workstations. Self-Service (campus.owu.edu) is the web interface to PowerCampus. It is where faculty should go to find their class lists and information on their advisees. Class lists feature an image view to help you match up names to faces. You may also use the Section Search feature to find class times for other faculty. How do I find my class lists? Log into OWU Self-Service from the Faculty/Staff menu on the OWU web site or directly at campus.owu.edu. Click the Classes tab along the top. Click the Enrollment link that appears below the tabs. Select a class from the drop-down list or choose one from the grid. At the midpoint in each term and at the end of each semester, you will enter official midterm and final grades for each course into Self-Service. Students may see their grades as soon as they are posted. Students use Self-Service to register for classes, view their schedule, and more. They may also share their academic and financial information with their parents at their discretion. For more information about PowerCAMPUS, go to the OWU PowerCAMPUS self-help page. OWU has an online degree planning and audit system, available at degreeaudit.owu.edu. Students and their advisors may use it for individual degree audits, “what if?” scenarios, student planning, sharing notes, and processing exceptions. More info is available on the Degree Audit page. Blackboard is OWU’s online learning management system (LMS) available at bb.owu.edu. It can be used in a variety of ways to share information with students, foster online collaboration, accept assignments, record grades, collect surveys, and assess students. Our Blackboard Learn system is release 9.1 service pack 6, and is hosted by the University of Cincinnati. It is updated from PowerCampus every 2 hours from 5:30 AM to 7:30 PM. Courses are created unavailable to the students. Instructors must opt-in to using Blackboard by making their course(s) available to their students. This can easily be done in the Course Control Panel | Customization | Properties. Courses with multiple sections can be merged into one Blackboard course. And content from past courses can be copied to current courses. Workshops on how to use Blackboard are offered each semester, and individual coaching is available on request. Many tips, tricks and instructions are available on the Blackboard self help page. myOWU is an online portal for the OWU community. Many commonly used data sources and websites, such as BishopApps and Blackboard, are collected in the portal, to serve as a starting point for information and processes at OWU. Other resources, such as the Software Center and the OWU Magazine Index, you will only find in myOWU. The content is dynamic and audience specific–you will only see tabs that pertain to you based on your affiliation with OWU. The myOWU home tab is the initial launch page when you first login and consists of content relevant to most OWU account holders. Prominently positioned here will be any University announcements, such as campus closures, and emergencies. There are modules or webparts that you may configure to show your upcoming calendar events and recent emails. Items from the OWU Daily and OWU Events calendar also appear here. The Faculty and Staff tab is only visible to campus employees and contains announcements pertinent to them. It features a documents repository and links to various employee specific resources, such as HR forms and the Buildings and Grounds work order request form. This is where you’ll find Course Evaluations. myOWU is also where you’ll find Course Evaluations. For more information, see the myOWU page. OWU WordPress is a multi-site WordPress server for the campus community. Would you like a blog or a WordPress site for your course, club, or department? Contact the Information Services Help Desk (x3120 or helpdesk@owu.edu) to discuss. Ohio Wesleyan University has engaged the services of Automatic Data Processing (ADP) to assist in the processing of payroll and several other human resources functions. This provides employees access to earning statements and W-2 forms 24 hours per day, 7 days a week. For more information on how to access the portal for the fist time, visit the help desk site. Who should I contact when I need help? The Self Help Site is designed for all your technology support needs at Ohio Wesleyan University. If the site fails there is also a Self-Help Desk in the bottom of the Corns building. Some of the menu items will expand into sub-menus. Information about web browsers will be found under Software. Information on operating systems will be found underSoftware. Information about mobile devices, such as iPads and Kindles will be found under Hardware. Gaming console information, such as how to connect them to our campus network, will be found under FAQ. Printing information will be found under Hardware. Instructions for using Reporting Services to generate mailing labels will be found under FAQ. When in doubt, or you can’t find what you’re looking for in the menus, try the search box. The Help Desk is to assist with faculty member’s technology problems when the Self-Help Site fails. Summer Hours: 8:30 a.m. – 4:30 p.m.
Who are the people in IT that I should know? “David Soliday has been the Instructional Technologist at OWU since 2010, and was Help Desk Manager from 2008 – 2010 before that. He posts reflections on educational technology and technical training to his blog, EdTech at OWU. David can consult on digital projects and provide technical training on request to dcsolida@owu.edu. Brian Rellinger is our Chief Information Officer . You may find his tweets on our home page of our departmental website. we’re here to help you make the best use of technology in the teaching and learning process. What opportunities are there for me to learn more? Each semester the TLCCPC (sponsors a number of faculty lunch seminars (usually one per month), where one or several faculty members give a presentation on their teaching, research, or curricular development initiatives. This forum is a great opportunity to learn from one another in a relaxed atmosphere, to discuss teaching-related questions or issues, and even to generate ideas for future courses or research projects. The Faculty Lunch Seminars are always scheduled for the noon hour (12:10-1pm), and take place in Science Center Room 228. The day of the week will vary. An email announcement is sent out during the week prior to the seminar. At that time you will also be invited to order a (free) boxed lunch. Interested in giving a presentation? For more information go to the Faculty Lunch Seminar page on the OWU website. The teaching and learning site contains teaching resources; information on workshops, seminars and conferences; and information on grants. Teaching reseorces include: Teaching Circle, Peer Observation Program, Textbook Submission FAQ, Classroom Assessments and more. Information on Workshops, Seminars, and Conferences include Faculty Lunch Seminars, Information Services Professional Development, OWU Libraries Faculty Friday Workshops, and Pedagogical Conferences. Grants are also explained for faculty engaging in research and improving education. For more information about the Teaching Circle visit the page on the OWU website. SQL Server Reporting Services (SSRS) is the main reporting tool used to view reports from Power Campus and some of our other campus systems. It replaced Cognos as our main reporting tool and most find that it is much easier to use. All you need to use SSRS is Internet Explorer and a valid login to our campus network. It is used to obtain data for mailing labels and other purposes. For in depth instructions on how to use SSRS visit the Reporting Services page on the Self Help site. What else might I need to know? At OWU, we have two Wi-fi Networks: BishopNet and BishopGuest. BishopGuest is for visitors only so you’ll want to configure your electronic devices to BishopNet. To connect, you will need to make sure you wireless connectivity is on, then click on the Wireless Network preferences on your device. Select BishopNet out of your available networks. It will then ask for authentication which will be your OWU username and password. An alert should come up displaying that the connection could not be completed. Select Connect anyways and then open a web browser and go to http://wifi.owu.edu/ to finish registration. Fill in your OWU username and password again then click Submit and you should connect to BishopNet in about 5 minutes. For more in depth instructions for your particular system: check out the BishopNet page on the Self-Help site. Additional hardware or software can be requested and borrowed from the Media Center in the basement of Beeghly Library. Equipment, films/videos, and other media may be rented with the submission of a Equipment Reservation Request or Media Reservation Request form at least four weeks in advance. More information, including Media Center Hours and phone number can be found on the Media Center website. Sophos Anti-Virus Protection is provided to faculty and is installed on all campus computers that were set up by Information Services. Files may be found at owufiles.owu.edu with Mac, Windows, and Linux versions. The Help-Desk is available to assist in installation. More in depth instructions can be found on the Sophos Anti-Virus page of Self-Help site.